This topic contains 2 replies, has 2 voices, and was last updated by Robin C 1 year, 7 months ago. I was trying to make Samsung ML-1610 (old model) printer work on my macOS Sierra installed iMac. It was really frustrating to search and find the correct driver to make the device work. It was one tough process while using Windows OS and i completely forgot this task after switching to Mac. Thought to give life to my old Samsung ML-1610 Mono Laser printer by connecting it to my iMac 27 inch non Retina model. After connecting the Printer, i came to know that the driver is required to make it work. I thought it will be easier at first, but after searching for nearly an hour, understood that it is going to be tough to find drivers for old printers. I then figured out that installing closer upgraded versions of the same product may make it work. 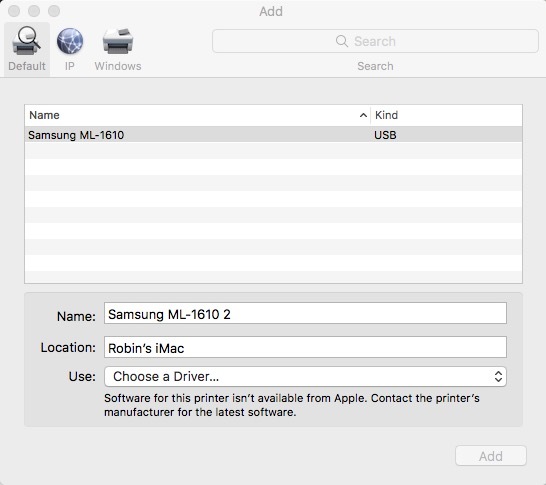 So i searched for the next models that samsung has released in the same year and found Samsung ML-1630 driver downloads are effective in making Samsung ML-1610 Printer work on latest mac os sierra. You can download Samsung ML-1630 Drivers here from samsung website and once its completed, double click and complete the installation. 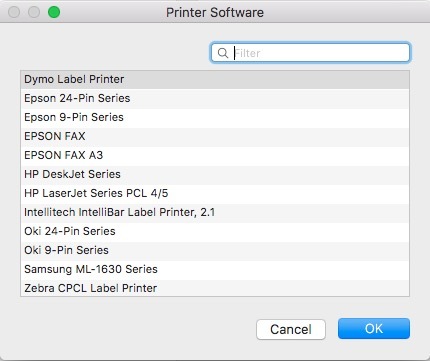 Connect the printer to your iMac or Macbook via USB and start the following process. Step 1: Open “System Preferences – Printers and Scanners” and click on “+” icon to add your printer. Step 2: You will see Samsung ML-1610 printer name in the list. Click on that and below, select “Choose a Driver…” from the “Use” menu. Step 3: Now click on “Select Software…” to locate the driver that you have downloaded from samsung website and installed. Step 4: Select “Samsung ML-1630 Series” from the list of drivers available readily for install and click “Ok”. Step 5: When you see a dialogue prompt confirming the installation of drivers for your Samsung ML-1610 printer, click “Yes” and complete the installation. Congratulations! You have successfully installed the printer driver for your Samsung ML-1610 and made it work on your Mac OS Sierra running computer. Feel free to share this post with your friends and followers on Twitter, Facebook and Google+. Have a great day. 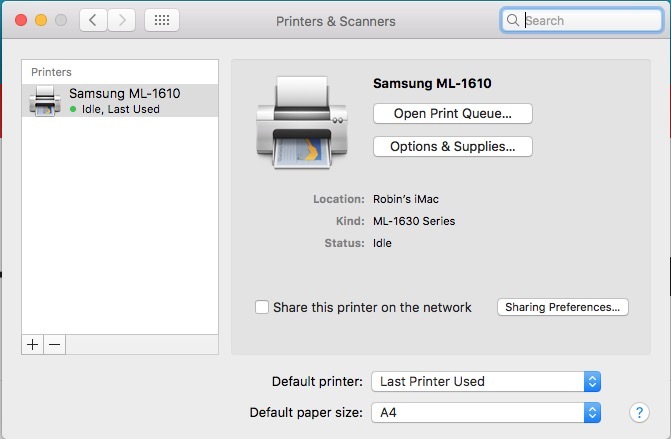 I just try to install my old samsung ml-1610 printer to my macbook(sierra version 10.12.5) but when I send a document, there is no action on printer. at first, document is seen on printer queue, some seconds later queue getting empty. Similar problem happened to me after trying out few prints. It is still causing problem at times due to the compatibility issue with the mac os as this model is not officially supported. So What i did is i connected with my Apple Airport Extreme and now the printer is working excellent through AirPrint option. I am sorry there is no software solution at present as far as i know.